Finally the ordeal is over. The new bike is here and done. On the same day it arrived my new back-up race wheels showed as did my powermeter back from SRM service. The Frame is beautiful to look at and rides very nice. Handling is similar to my old bike which is no surprise since I had the builder use much of the same measurements. The ride is smoother and much stiffer without rattling my kidneys out. The new wheels, wow, they are awesome for a basic budget build. They are Niobium 30's/DT Aerolites and DT 240 hubs. The ride is fantastic. They are quiet, stiff and and smooth. I am so impressed with them. 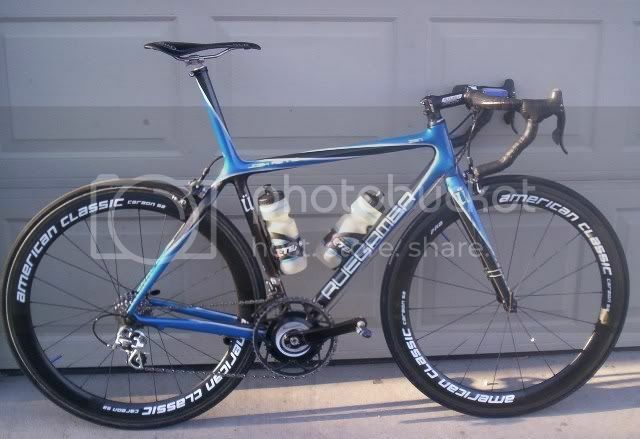 Very nice... lets see it with some Reynolds or ACs on there. I'll be up your way again probably for Copperopolis, Orosi, snd Hanford.